South of Boulder Peak we approach our descent to the Upper reaches of the East Fork of the Carson River. So far we have been hiking moving Southeast along Eastern flank of the High Sierra crest approaching the top of the Western bank of the East Carson River. After a sweet look South up at the fine granite lining both sides of the upper canyon of the East Carson River we will now come off the Sierra crestline to descend switchbacks down to near the East Carson River before we make the final climb up to and through its headwaters bowl. Though we have dropped into the river valley from the crest line, the trail generally keeps its distance from the East Carson River as we climb the upper reaches of this valley, with a few notable exceptions. Coming down to river level we encounter the informally marked junction with the well-established unmaintained route heading Northeast, down the East Carson River. This junction is well-established. The route down to Carson Falls is not. Don't attempt this unless you are an experienced backpackers in good shape with excellent route finding skills. Nonetheless, a fine campsite sits about a hundred yards East down this trail junction. This large site is sheltered from the trail, overlooks the East Fork of the Carson River, and is a real nice place to camp. A rough campsite sits a few feet to our Right just off the PCT, to our West. The Pacific Crest Trail junction with the East Carson River Trail marks the end of our descent and the beginning of climbing for hikers in either direction. The Southbound hiker faces the long steady up mountain hike to the East Carson Gap, and then on through the 10,500 foot Sonora Gap before the trail flattens out for the traverse across the South Flank of Sonora Peak before we descend to the 9600 foot Sonora Pass. The Northbound hiker climbs the switchbacks back up to the Sierra crestline, followed by the roller coaster of ups and downs of crossing the drainages off the crest. North of Murry Canyon the trail begins gently descending to Wolf Creek Pass, then enters the N Mokelumne River watershed for a minute climbing to cross Tyron Peak. 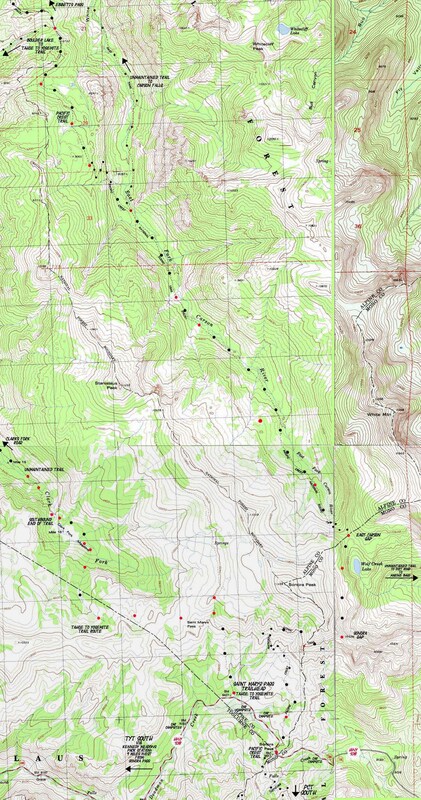 The map above depicts the Pacific Crest Trail from the Boulder Lake Trail Junction to Sonora Pass via the Upper reaches of the East Fork of the Carson River, Wolf Creek Lake, and the Sonora Gap. Click the labels w/ arrows pointing to adjacent hiking maps to see those maps. Click the red dots for the trail guide page entry for that location. Those squares breaking the maps up into grids are the Universal Transverse Mercator / Military Grid Reference System, otherwise commonly known as UTM. From my perspective that is 1093.6 yards or .62 of a mile. Approaching Highway 108 from the North on the PCT.